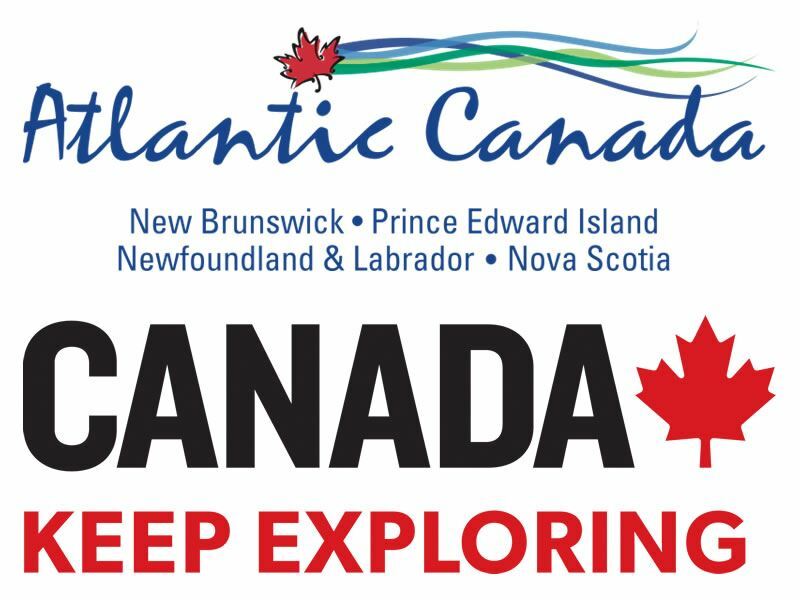 Canada’s east coast offers the chance to experience fascinating historical and cultural attractions against a spectacular backdrop of sandy beaches, breathtaking coastlines and soaring mountains. Referred to as Atlantic Canada, it’s made up of four eastern Canada provinces: New Brunswick, Nova Scotia, Prince Edward Island, and Newfoundland and Labrador. 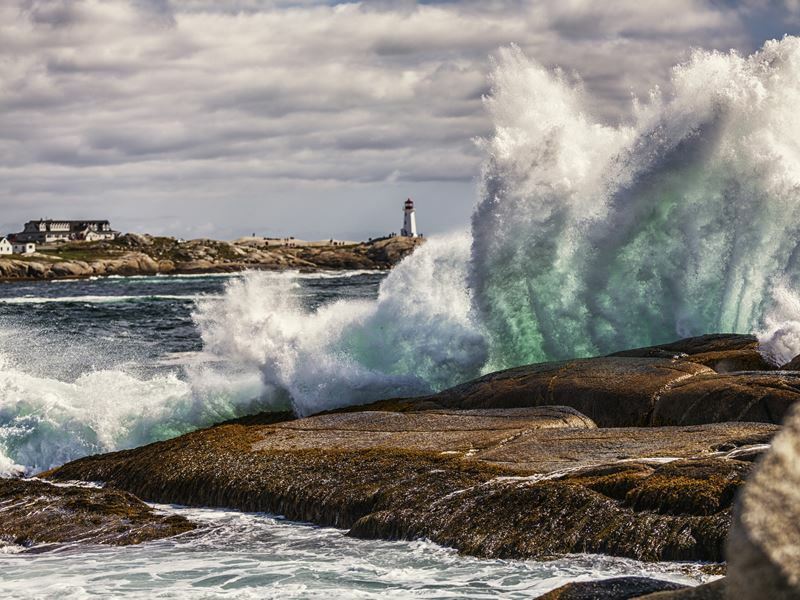 What many travellers are so awestruck by when visiting this region, is the beauty of the many lighthouses that have served as beacons to sailors attempting to safely navigate the rugged coast. While modern technology may have made them mostly obsolete, many still stand as important symbols of Canada’s nautical history. 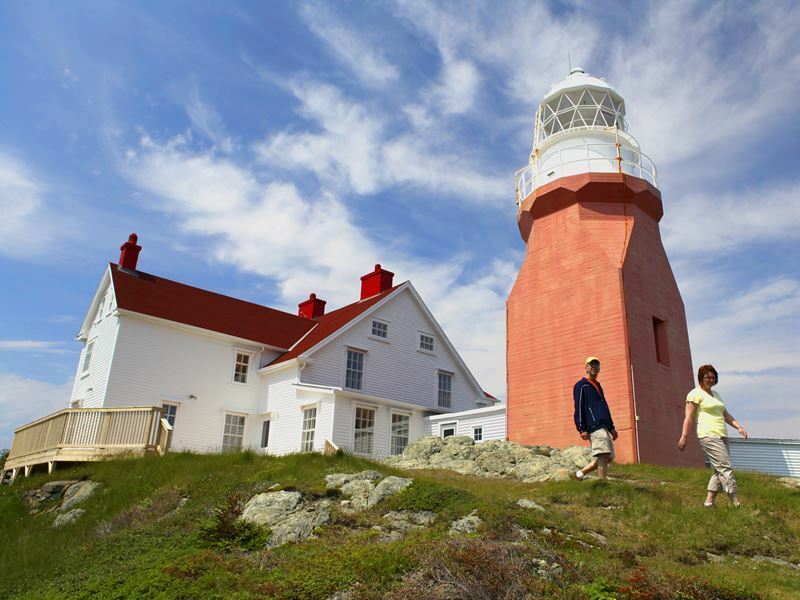 And for lighthouse lovers, there are few better ways to spend a holiday than exploring Atlantic Canada’s especially magnificent world of lighthouses, while taking advantage of the many other alluring attractions in between. New Brunswick, often called Canada’s “home of natural wonders,” has two coastlines, with its northern coast facing northeast on the Gulf of St. Lawrence and Northumberland Strait, and the southern coast facing southeast on the Bay of Fundy. Here you can discover the highest tides in the world, watch for whales, enjoy all sorts of activities on the water, play in the sand, and, of course, visit lighthouses. There are practically an endless number of lighthouses in this province, with not only coastal lighthouses, but lighthouses that sit along the estuary of the St. John River, which empties into the Bay of Fundy. To get started, we’ll begin on Campobello Island, situated the entrance to Passamaquoddy Bay. While it’s off the coast of Maine, this unspoiled island is considered part of New Brunswick as one of the three Fundy Islands. From the U.S., it can be reached by driving across the D. Roosevelt Memorial Bridge in Lubec, Maine, and from Canada, it’s accessible via ferry, though you’ll have to take one from mainland New Brunswick to Deer Island, and then another ferry to Campobello. Popular activities here include bird watching, hiking, whale watching, beachcombing and lighthouse exploring. In fact, the Head Harbour Lightstation, also known as East Quoddy Lighthouse, is one of the most photographed in the world. It sits just a few miles from the very spot Franklin Delano Roosevelt has his summer home, overlooking the Bay of Fundy. 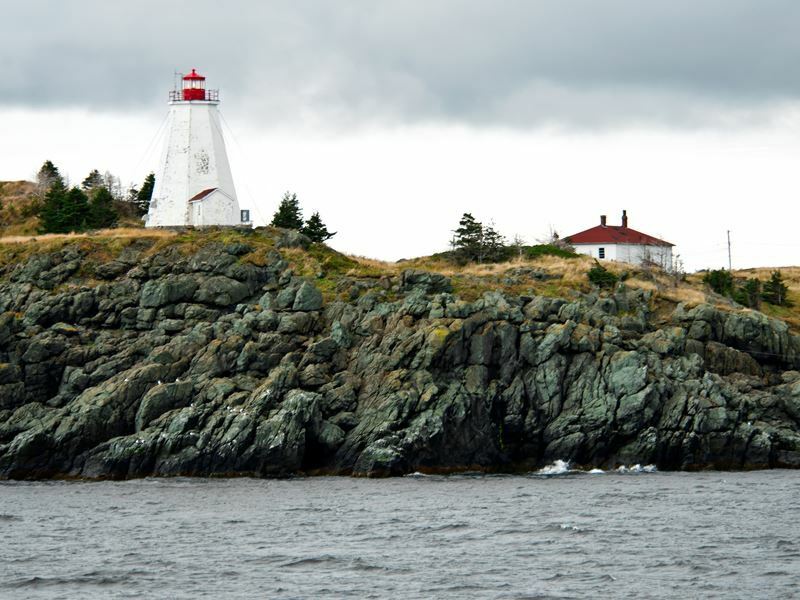 It’s the province’s second oldest lighthouse, built in 1829 to assist ships who were trying to navigate the island’s treacherous rocks, and often dense fog. To visit it, you’ll need to check the tide tables and wait for low tide as it sits on Head Harbour Island, which is accessible only on foot. The original wooden tower which has a white exterior with a red cross, remains in use and the light still shines across the bay. While it’s no longer staffed, there are interpreters at the site who can provide details about its history and the island. While it’s not open for public tours, Mulholland Lighthouse can also be found on Campobello. Constructed in 1885, it helped to guide small coastal boats, passenger ships and freighters that sailed through Lubec Channel. Overlooking the narrows, it makes a wonderful spot for a picnic. Be sure to look for the seals that enjoy lounging around the bridge pillars too. To get to Grand Manan Island, the largest of the Fundy Islands, you’ll need to take a ferry, where upon your approach you’ll be greeted by the Swallowtail Lightstation, constructed in 1860. The historic wooden lighthouse draws many artists and photographers with its idyllic setting. The active lighthouse is operated by the Swallowtail Keepers Society and includes picnic tables, benches, interpretive signs and a small gift shop. In the summer, it’s open for tours, and visitors can climb the stairs to the top as well as explore the lighthouse museum. 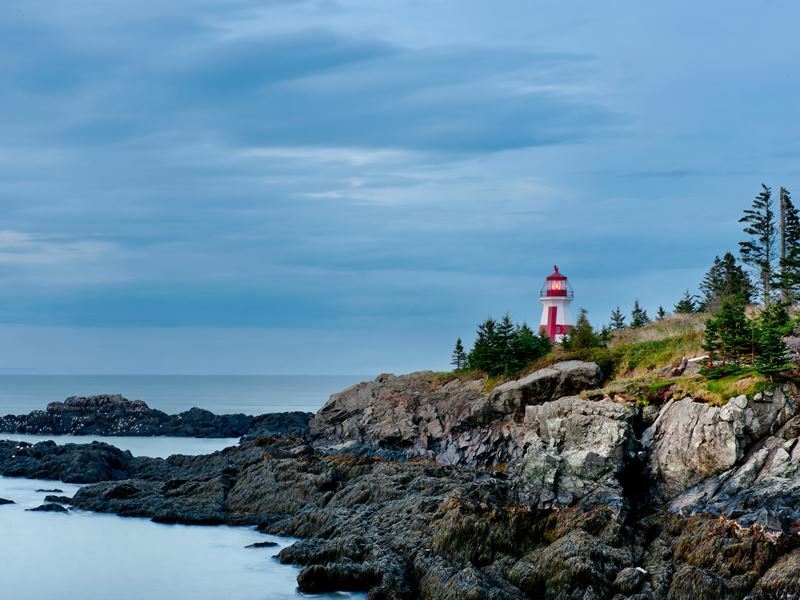 While you’re on Grand Manan, you’ll also have the opportunity to enjoy coastal hikes, kayaking and getting up close to puffins, migrating whales and seabirds. It’s a great place to camp too – just imagine falling asleep to the sight of billions of twinkling stars and perhaps even the songs of the whales. From vineyards and waterfalls to endless scenic trails and picturesque lighthouses, Nova Scotia is a fantasy come to life. 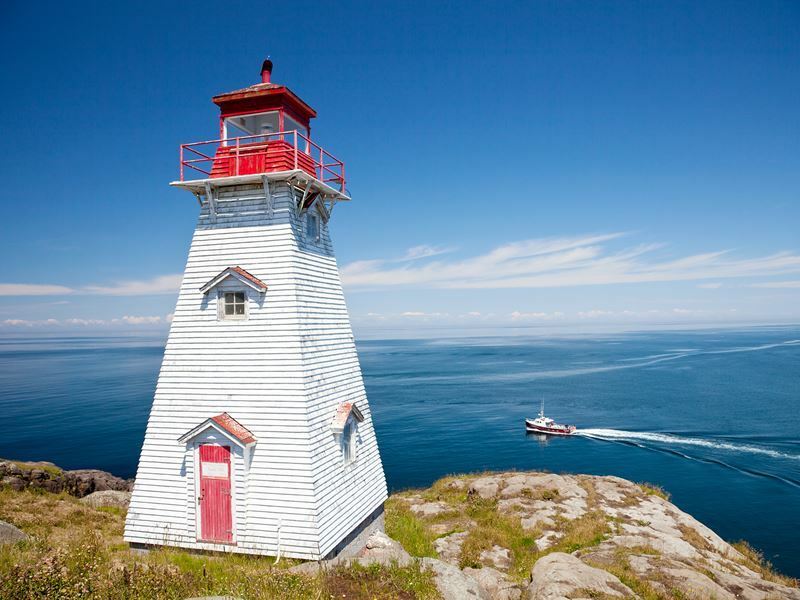 Home to the greatest number of lighthouses in all of Canada with over 150, navigational lights dot its coastlines, from Cape Forchu to Louisbourg. Peggy’s Cove Lighthouse along the south shore is one of the most famous lighthouses in the entire nation, as well as one of the most photographed. The classic red and white lighthouse marks the eastern entrance of St. Margaret’s Bay and was first lit in 1915. 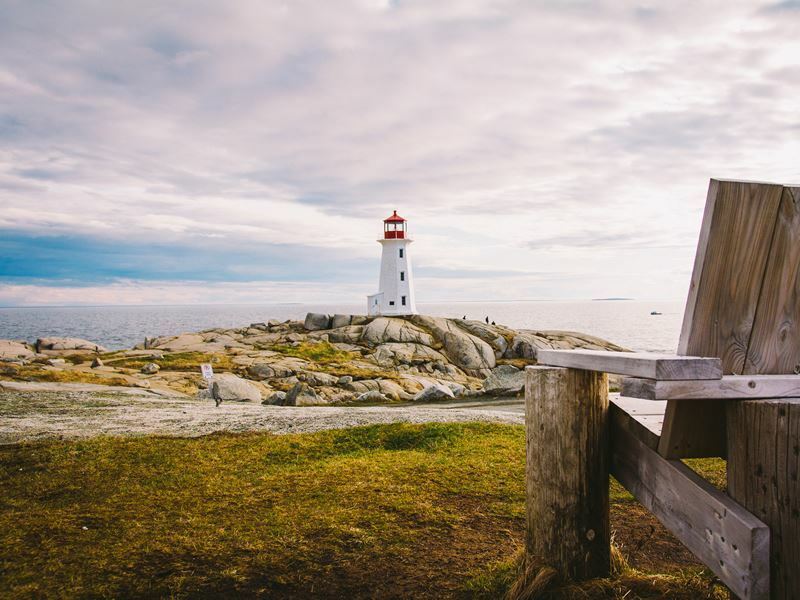 Situated in the quaint fishing village of Peggy’s Cove, the image of the lighthouse on top of the massive rocks with sea waves crashing against it has always been a striking sight. After you’ve snapped a selfie with it, take a stroll through the village and browse the boutiques that showcase local arts and crafts. Historic Boar’s Head Lighthouse, constructed in 1864, sits atop impressive cliffs at the northeast tip of Long Island where it marks the entrance to Petite Passage near Tiverton. In addition to capturing images of this weather-worn, yet beautiful lighthouse, you’ll find glistening lakes, tidal bores and scenic coves to explore. Cape Breton Island, considered one of Canada’s most romantic destinations, offers more impressive scenery, a laid-back atmosphere and uniquely Gaelic origins. You’ll find lush hillsides, beaches speckled with sea glass and the opportunity to spot whales while hiking in Cape Breton Highlands National Park. Take the Lighthouse Trail, located across the harbour from the Fortress of Louisbourg, to visit Louisbourg Lighthouse, the most popular on the island. The 2-kilometre walk will lead you around a looped trail to the lighthouse that was completed in 1923. This site, however, was home to Canada’s very first lighthouse, constructed in 1734. Interpretive signs explain its history. Low Point Lighthouse marks the eastern entrance to Sydney Harbour at New Victoria. The octagonal concrete tower is painted white and features a red painted iron lantern that’s from the original Chance Bros. Fresnel lens. In operation since 1832, today it is still used as a navigation aid for ships. It recently won $75,000 in a national crowdfunding contest which will go to repairs as well as to make the site more tourist-friendly. Joined to the mainland at Barrington Passage by a short causeway, Cape Sable Island is known for its long stretches of sandy white beaches, lobster and the Cape Sable Light, the tallest lighthouse in Nova Scotia. While there is no road to get to it, from Daniel’s Head Beach you can get a fabulous view, and if you’re here in early August you can also catch sandlerlings and other shorebirds along the shoreline. 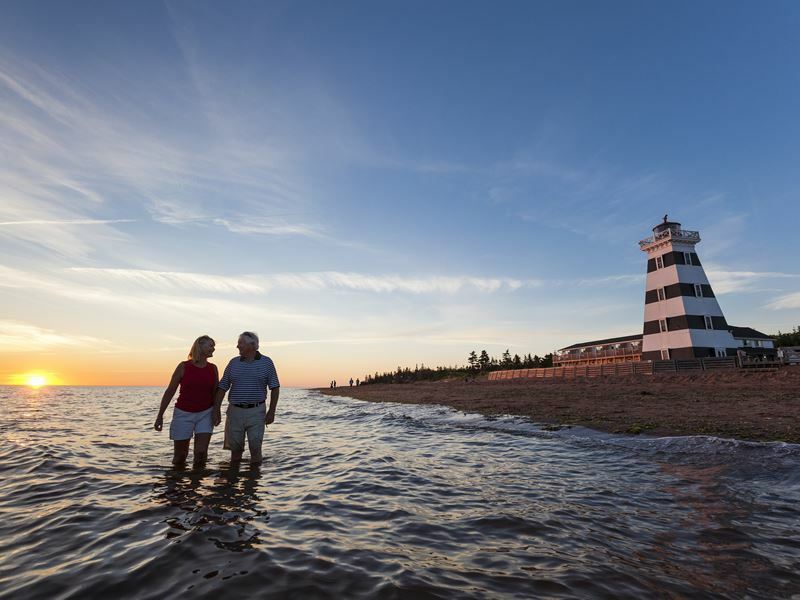 Prince Edward Island may be Canada’s smallest province, but it has more than 90 beaches that are ideal for beachcombing, bird watching and wind surfing in the north and swimming in the south. It comes alive with music and festivals all summer long and into the fall, with lots of maritime music and mouthwatering cuisine like Atlantic lobster, Island Blue mussels and Malpeque oysters. 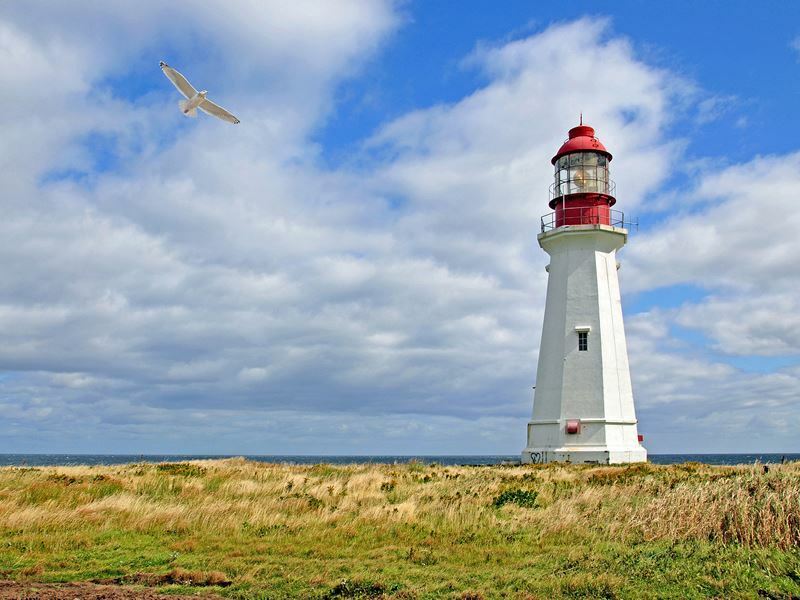 There are lighthouses of many different shapes and sizes dotting the coastline, and PEI offers one of the more unique experiences in Atlantic Canada: an overnight stay in a lighthouse. West Point Lighthouse is not only one of the most photographed lighthouses on the island, it’s the country’s first active lighthouse to operate as an inn, and each of its 13 guest rooms offer awe-inspiring views of the Northumberland Strait. The horizontal black-striped lighthouse also features a museum with one of the island’s most complete collections of lighthouse information and memorabilia as well as exhibits on the island’s history. Souris East Lighthouse, built in 1880, is the only lighthouse that allows visitors on its balcony. Climb up to the lantern room of this wooden tower on Knight Point, walk out to the balcony and you can soak up a spectacular panoramic view of the harbour and the town of Souris. The lighthouse also host an interpretive centre with an impressive sea glass collection and a nautical gift shop. East Point Lighthouse is another must-see. The 64-foot-tall white octagonal tower was completed in 1867 and is one of the visited and photographed sites in the province. Situated at the most easterly point of land on PEI, it boasts a truly breathtaking view from the top, where you’ll get a bird’s eye view of the meeting tides, seals and all types of sea birds. Both guided and self-guided tours are available. The oldest lighthouse on Prince Edward Island, Point Prim Lighthouse was built in 1845. Climb 60 feet to the top and you’ll discover a gorgeous view of Hillsborough Bay and Northumberland Strait from the unique round structure. This is the only round lighthouse on PEI, and one of only a few round, brick lights in the entire country. Visitors can take a guided tour, view historic displays, pick up souvenirs in the gift shop and enjoy lunch in the picnic area. The easternmost Canadian province of Newfoundland and Labrador offers especially impressive scenery from wild coastlines to dramatic mountains, fjords and an abundance of wildlife. 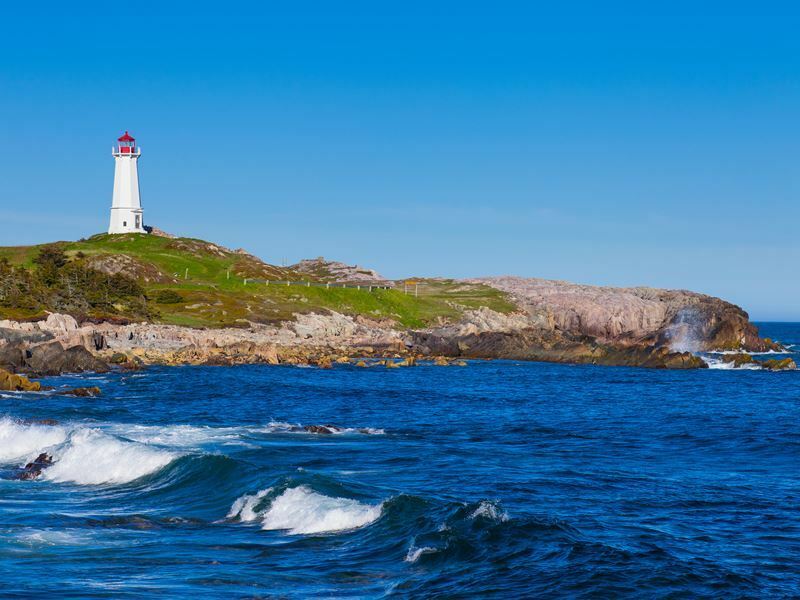 With over 18,000 miles of winding coastline laden with inlets, submerged rocks, icebergs and often heavy fog, it’s no surprise that the province also has hundreds of navigational lights hugging its shores. 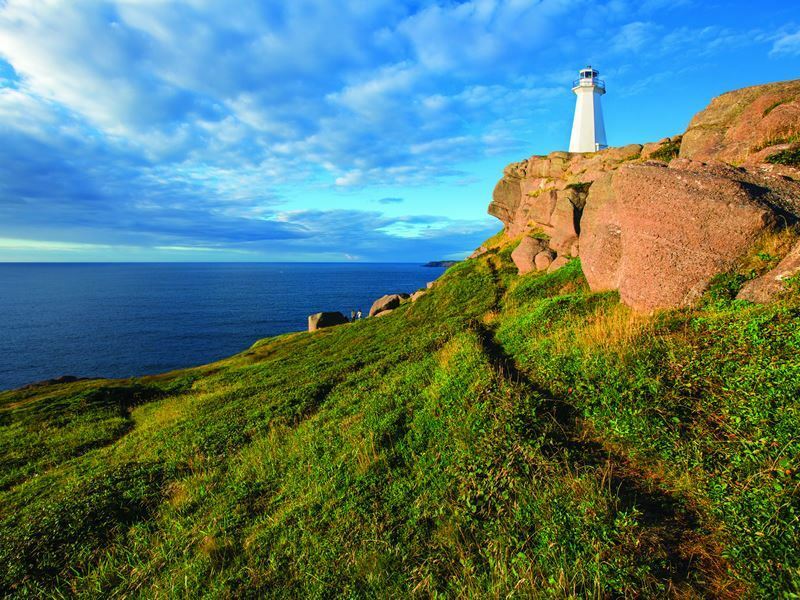 Visit Cape Spear, just a short drive south of the capital city of St. John’s, and you’ll be in the easternmost spot of the western hemisphere. This is where you’ll find the Cape Spear Lighthouse, perched upon a rugged cliff. Flashing since the mid-19th-century as an iconic symbol of the province’s mariner history, it’s the oldest surviving light in Newfoundland and Labrador. Get here just before the sun comes up, and if you’re lucky enough to be here on a clear day, you can catch one of the most glorious sunrises on the entire planet. Just north of Elliston, renowned for its puffin sightings, the Cape Bonavista Lighthouse offers the rare opportunity to climb the same stone tower and view the very same light fuelled by seal oil that was used in the 1800's. Visitors can step in the shoes of a mid-19th century lighthouse keeper who had a never-ending job of polishing the glass, keeping the oil lamps burning, gazing out at the waves and recording weather patterns. Up north in Twillingate at Crow Head, Long Point Lighthouse offers more incredible photo ops as one of the most photographed landmarks on the northern coast. Sitting at more than 300 feet above sea level, a lookout point provides panoramic Atlantic vistas as well as the opportunity to glimpse icebergs, seals, sea birds and passing whales.